It has been 3 exact years from 2011 since I tried out Joed's Lutong Hapon. They were located in Juan Luna Extension in Mabolo near the basketball court and then moved to Sacred Heart Girl's High. 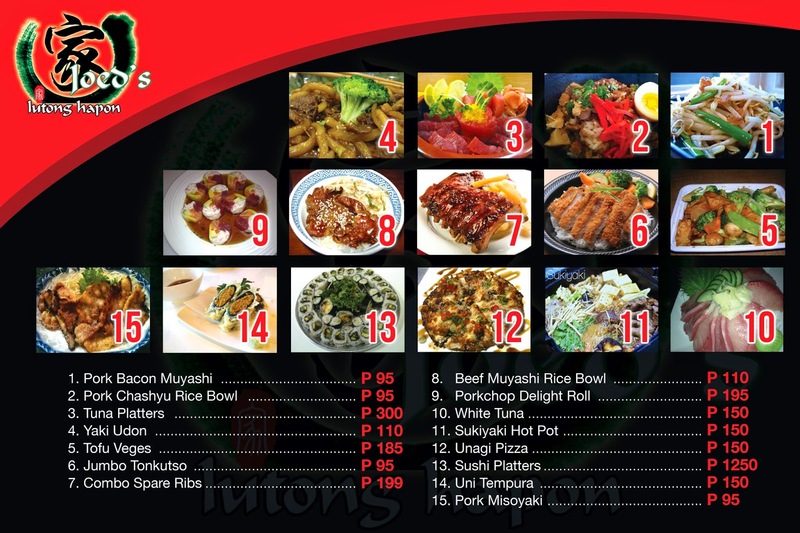 Now, they are located in F. Cabahug Street in Mabolo and offering Japanese food at your convenience. This is the same street heading to Sykes and where Burger Joint used to be. It's between the intersection of Sarrosa Hotel and Sunday 2PM. Back then, you had to fall in line for tables to vacate before you can be seated. Now, they can accommodate to 30 guests at once. The space was fully ventilated and while you wait, you can watch the flat screen TV near the counter. The wait wasn't that long during the time we visited, we were the only one who was around. I guess it was around 1AM. Yes, cravings got me real bad. The counter is where the magic happens, the place was kept clean and the service crew at your beck and call. They have the most attentive team as well. Always ready to attend to your needs. I was given a pitcher full of service water. I'd like to note that the water was of best quality! Thumbs up! To start, I ordered the Crab and Corn soup. Soothing and truly delectable. This soup goes perfectly well with a hot bowl of rice. Hello there California Maki, how lovely to see you. Remember my post about the Maki I had at Tempura Japanese Grill? Well this was a good contender. I had to stop myself before I eat out the 10 piece platter. The Combo Spare ribs at Php199 was enormous! Look at the size of that! And yes, they thought that the rice isn't enough as your carbohydrate source, they added potato fries to the side. The glaze was really good, a good combination of soy, oyster sauce and pepper. It's not the usual you get from other shops and you will definitely not feel umay after eating. The rice serving was in good proportion to the meat. I could not get enough of the glaze. It was so good. I could come here and just have this and not eat for hours. I was that stuffed! I wanted something with crunch hence I ordered the Beef Muyashi Rice Bowl at Php110. I have always liked texture on my meals and this one served me just that. Aside from the umami goodness from the tender beef strips to the crunchy alfalfa and let's not forget the lovely jasmine rice that truly fills anyone's hunger. This is why I love Japanese food, their flavors are just simple but truly palatable. No wonder these guys have been in the business since 2009. A great Cebu gem truly worth visiting.